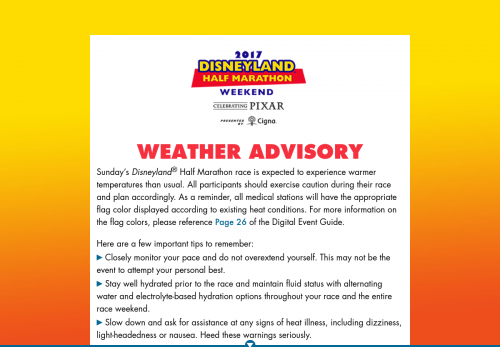 Sunday’s Disneyland® Half Marathon race is expected to experience warmer temperatures than usual. All participants should exercise caution during their race and plan accordingly. As a reminder, all medical stations will have the appropriate flag color displayed according to existing heat conditions. For more information on the flag colors, please reference Page 26 of the Digital Event Guide. Closely monitor your pace and do not overextend yourself. This may not be the event to attempt your personal best. Stay well hydrated prior to the race and maintain fluid status with alternating water and electrolyte-based hydration options throughout your race and the entire race weekend. Slow down and ask for assistance at any signs of heat illness, including dizziness, light-headedness or nausea. Heed these warnings seriously.